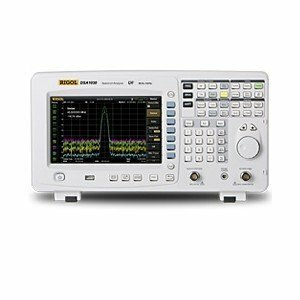 The Rigol DSA1020 is a compact and light Spectrum Analyzer with premium performance for portable applications. The use of digital IF (intermediate frequency) technology guarantees reliability and performance to meet the most demanding RF applications. The very large display (21.6 cm / 8.5") of the Rigol DSA1020 Spectrum Analyzer with a resolution of 800x480pixels provides a very good overview over all its comfortable functions like Auto Tune, Auto Range, Auto Scale and Auto Couple. These functions enable the analyzer to acquire signals and match parameters automatically, instead of the manual process necessary with a traditional analyzer. The Rigol Spectrum Analyzers have a sophisticated and easy to use user interface and offers multiple functions for all tasks. The menu navigation is very intuitional in use and all functions and parameters are easy to reach because of the graphical interface. 7.5 kg (16.54 lbs) with connected battery. The battery is not included.